A Coast Guard helicopter crew medevaced a 44-year-old man from the fishing vessel Golden Alaska approximately 60 miles northeast of Cold Bay, Tuesday. The weather at the time of the evacuation was 15-knot winds, 1 to 3-foot seas and 10 miles visibility. After hoisting the man up, The Jayhawk helicopter crew safely transported him to Cold Bay for further transport by commercial services to Anchorage. 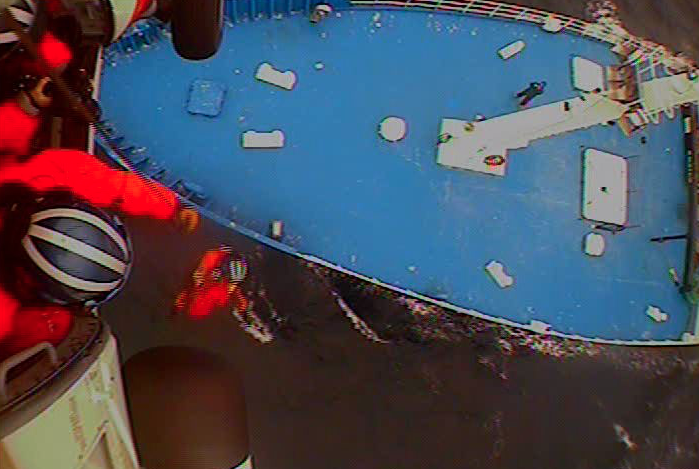 A helicopter crew from Coast Guard Air Station Kodiak rescues a man from the F/V Golden Alaska on Feb. 20. Watchstanders at the Coast Guard 17th District command center received a medevac request from Health Force Partners for a man suffering from stroke symptoms Tuesday afternoon. Watchstanders notified the Coast Guard duty flight surgeon who recommended the medevac. On scene weather at the time of the medevac was 15-knot winds, 1 to 3-foot seas and 10 miles visibility. King Cove officials say poor weather wouldn’t allow other aircraft to land, so they requested a Coast Guard helicopter to medevac the man to Cold Bay. He was later sent to Anchorage for further care. The two incidents combined mark a total of seven medevacs for the winter fishing season.